The Spring Cloud Data Flow team is excited to announce the release of 1.4.0 M1. Follow the Getting Started guides for Local Server, Cloud Foundry, and Kubernetes. A big focus of this first milestone release of the 1.4.x line has been the Dashboard UI. In an effort to keep our UI dependencies current at all times, we finally upgraded the UI to Angular 5.2 and Angular CLI 1.6. Furthermore, the UI now provides better integration with Spring Cloud Skipper. As such, you can now manage the versions of App Registrations and set a default version. The version information is now shown on the App Registration list page as well. Besides providing better visual hues regarding the Application Types (Source, Sink, Task, Processor), you can now also search for App Registrations by Application Type. Additionally, when browsing the App Registration details, you can easily select the version for which you would like to see the details. 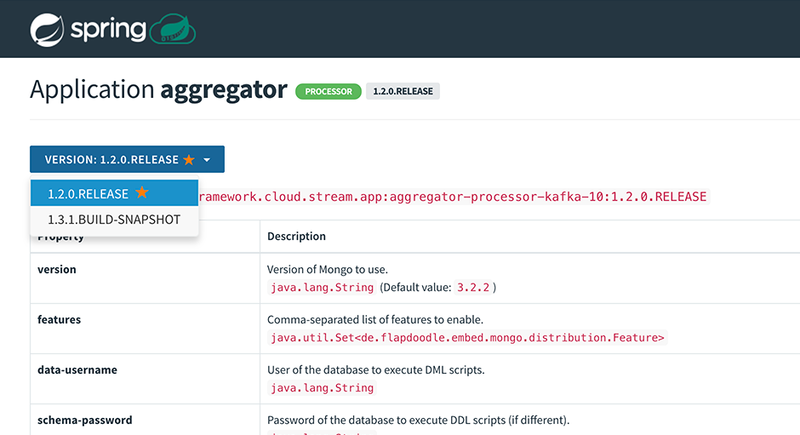 When deploying streams, you now have the ability to deploy them to multiple platforms. Lastly, in this release we also polished the Reference Documentation and documented among other things the UI support for named destinations to facilitate fan-in/fan-out scenarios. As always, we welcome feedback and contributions, so please reach out to us on Stackoverflow or GitHub or via Gitter. Please try it out, share your feedback, and consider contributing to the project!